These checks should be done every time you enter the car and before you start the engine. When you first get in the car you should always check the parking brake is on. Before starting the car check the gar lever is in neutral or park for an automatic. Listen to people closing the doors. 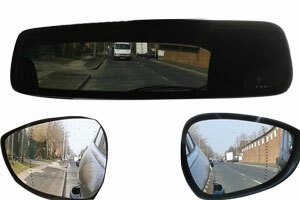 Check door mirrors to see bodywork lines up. Check to see the interior light is off. Check there are no dashboard warning lights on. Adjust the height for the best veiw out of the windscreen. 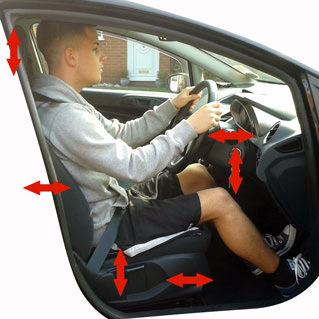 Move the seat forwards or backwards so that your leg is slightly bent when the clutch (left pedal) is fully depressed without stretching and without being cramped up. Adjust the steering wheel in or out and up or down. Your arms should be slightly bent when the steering wheel is held correctly. Both hand at the top of the wheel.